Features 2GB Dual Data Rate (DDR) SDRAM. GE Fanuc Embedded Systems Inc. has introduced the CPCI-7808, a single slot CompactPCI single board computer (SBC) that offers low power consumption via Intel's Pentium M and Celeron M processors. The device delivers the high performance and reliability required for demanding embedded computing applications. 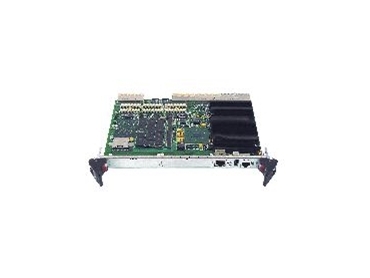 The CPCI-7808 features a 400MHz system bus and incorporates Intel's 855GME graphics memory controller with up to 2GB Dual Data Rate (DDR) SDRAM, as well as a 1.4GHz Pentium M option for the most power sensitive applications. "The CPCI-7808 is GE Fanuc Embedded Systems' answer to the expanding array of embedded computing challenges facing many industries today," said GE Fanuc Embedded Systems Commercial Leader for Asia Pacific, Jessie Qin. Fully compliant with PICMG 2.16 CompactPCI Packet Switching Backplane (CompactPCI/PSB) specifications, the CPCI-7808 features dual PMC sites (64-bit/66MHz PCI and 32-bit/33MHz PCI), parallel and serial ATA, dual integrated serial ports and three USB ports. This SBC also has a CompactFlash option available via the rear transition module (ACC-0591). It includes operating system support for Windows 2000, Windows XP, QNX, Linux, and VxWorks. The CPCI-7808 is available now.